WILLIAMSPORT, Pa. - Throughout the summer, athletics.lycoming.edu is proud to feature a series of alumni profiles that will help reconnect Warrior fans with some of the remarkable athletes who have worn the Blue and Gold. 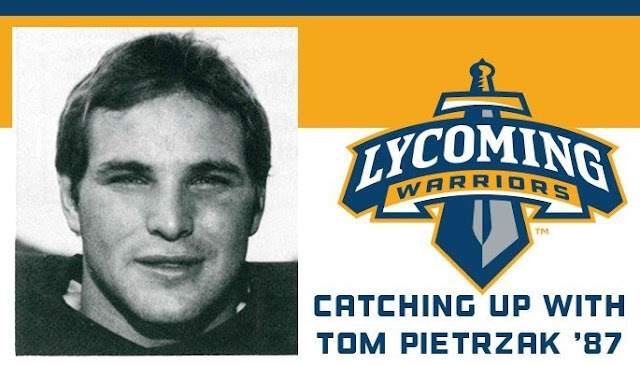 Today's feature is on the leading tackler in the history of the football program, Tom Pietrzak '87. From 1983-86, the Lycoming College football team featured seven All-Americans, 19 future Athletic Hall of Famers and 34 All-MAC selections, so it's easy for a great player to get lost. Those teams in the mid-80s are some of the best in the history of the Lycoming College football program and the defense led the way. The man in the middle of those defenses creating havoc was Pietrzak. When Pietrzak was at his middle linebacker spot, the Warriors allowed only 11.1 points per game, including 6.8 in in 1982 and 7.3 in 1983, adding 12 total shutouts in his career, including four straight at one point in 1983. He was the catalyst in a defense that led the nation in total defense in 1983 with 154.5 yards per game. In his four years with the team, the Warriors went 31-8-1 with a MAC Northern Division Championship in 1982. He led the team in tackles in three of his four years. In 1983, he had 152 stops, the most in program history and in 1986, he had 148, the second-most. He finished his career with a program-record 440 tackles. In the history of the program, only 11 players had more than 100 tackles in a single season and Pietrzak has three of those seasons. He holds five of the top 10 spots for tackles in a single game, as he had at least 18 tackles five times. Pietrzak was an honorable mention selection to the Sports Information Directors All-American team in 1986. He was also a three-time member of the All-MAC teams, once as an honorable mention selection and twice as a first-teamer. He was inducted into the Lycoming College Athletics Hall of Fame in 1994. Pietrzak is currently teaching math in the North Penn School District, where he has taught for 28 years. He also coached football at North Penn and Upper Moreland High Schools for 15 years and worked on the Wildwood Crest Beach Patrol for 17 summers. In his spare time, Pietrzak enjoys rowing competitively on the Schuylkill River and traveling the world with his wife, Kathy. Athletics.lycoming.edu recently asked Pietrzak a few questions about his time at the college and what advice he would have for today's football players. What was it like to be coached by Frank Girardi and Steve Wiser? Both men are born leaders and winners. They coached with passion and enthusiasm. You were always prepared, and they inspired you to work and play hard. You are the programs all-time leading tackler. How were you able to always be around the ball? I worked extremely hard on and off the field. I spent many hours studying firm and getting extra work in after practice. The guys that I played with were outstanding, unselfish players. We were always well prepared and everyone did their job, which made it easy for me to do mine. What was your favorite place to play besides at Person Field? Widener and Delaware Valley. I grew up in Philadelphia, so I always had a lot of friends and family attending the game. What do you remember about the 1985 season when your team won the MAC Championship and made it to the NCAA Tournament for the first time in school history? That team was made up of an amazing group of guys, and it was the first year that Lycoming was viewed as a national power house. What was the most memorable game that you ever played in? When we beat Widener 37-0 in 1983. That was the first time that Lycoming had played Widener since the '50s and it was special because they got the NCAA Tournament bid in 1982 even though both teams had the same record. It also made it special because half of our team was from the Philly area, and it was their homecoming. What are some of your favorite memories about attending Lycoming College? Playing football and being part of a winning program, the friendships that I made and the relationships that were formed and the education that I received.